Animation, Voice Acting, Game or e-sports will be your Job! We, Tokyo College of Anime do our best to support you. There are so many chances for our graduates to work in the field of Animation, Subculture scene or e-sports genre, not only in Japan but also in their home countries to launch their own business. Our school objective is to make more such opportunities for the students. We can tell, since Tokyo College of Anime always continues to try new things. “Is it difficult to become a voice actor?” If this question is your main concern, let's try to think how and what should be done to become a voice actor instead of giving it up. That’s the way most of our current students entered the voice acting industry. 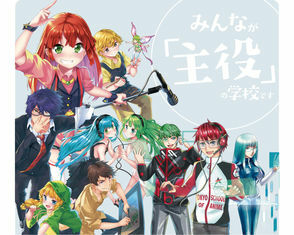 “Is it true that anyone who is physically strong with strong mind can enter the anime voice actor industry?” Regardless if it's true or not our school has prepared the latest technique that will to be the standard of the industry and is able to raised talented performer who can play an active part in the world. We are also the first vocational school in Japan to offer e-sports courses. Our own unique curriculums are designed to develop Pro Gamer and other professional on e-sports events and business in either Japan or your home country. and facilities equipped with latest game equipments. And whenever you have any troubles or problems, feel free to consult with our full time staff members who are always available to help. You will be able to concentrate on your studies when realize your dream to work in the professional world of industry. During a school life here, you will have a confidence that you make a lot of progress and your dream will come true. Please come by to our Open Campus Day held every Sunday. With this, you can experience a little bit of the school life here of Tokyo College of Anime. ①Scholarship in form of reduction and exemption of tuition fees is available for eligible International Students. ②“JIKEI COM International Center”is the school's office to support each international student with several languages available such as Mandarin, Korean and English in relevant inquiries such as tuition fee, visa application, accommodation and etc. ③There are 2 Japanese language classes (elective) every week for international students to improve their language ability as well as learning the Business level Japanese. ④All lectures are provided by well experienced lecturers and they teach based on the updated information of the current changes in the industry. ⑤All our facilities are well-equipped with professional specifications so as to make it as though the students are working on the real site. We encourage students to learn to always be conscious of the professional site and get accustomed to the practical work scene. Equipment rental is available for students to utilize within the campus for free. ⑥Our school is located 3-minute-walk from Tokyo Metro/Subway's Nishikasai Station, and is approximately 15 minutes away from Otemachi Station and Tokyo Station, with lower living cost and livable environment best for students. It is also quite near from Kasai Rinkai Park and Tokyo Disneyland. ⑦We have more than 70 affiliated schools providing more than 500 occupation training. If you change your mind after enrolling, you will still be able to switch to the field/college that you wish to enter. There will be school briefing session carried out on every Saturday and open campus with trail-class on every Sunday. You are always welcome to join us! The best environment to learn Animation and Comic Illustration! You can learn simultaneously both Game Creation and e-sports! ①Industry Project: We'll invite the top corporations from Anime and Voice Acting industry to carry out post recording and animation producing activities. Through their activities, students will be able to gain the power for constructive concepts, creativity, presentation skills and communication skills of which are mostly required by the industries. ②School-Industry Cooperation Education System: From Animation, Voice Acting, Game and e-sports industry, we will get to work with more than 250 various corporation along with affiliated schools. Students will be able to think on their feet and become more competitive as a professional through these sufficient training. Practical work-sites will be your classroom! ③Double Major System: You will also be able to take other courses besides from your major upon enrolling. From wide range of knowledge, you will be able to improve internally on your personality which will benefit your future career and debuting. Even if you change your goals or targets, we will improve our curriculum based on it. ④Overseas training: For entertainment training, we will conduct an overseas training in the United States. Through the experience, you'll learn something exciting which you cannot in Japan. ⑤ Our Lecturers and Guests: We have the network to invite expatriate and special lecturers from domestic and overseas who are qualified in advanced technology, knowledge and experience to conduct premier seminar and support our students. ⑥ Debut・Career System: We're collaborated with more than 300 corporations to connect students with professionals in their aimed career field. Students will master practical skills under this double major curriculum, industrial cooparation project and enterprise room within 2 years via this debut support system. For further information please refer to our brochure. Exemption amount will vary depending on the course. For more information, please contact the school. ●Students who fulfill the following conditions will be eligible for tuition fee exemption. 1. 80% or more attendance at your present Japanese Language School. 2. Holds a N2 level in the Japanese Language Proficiency Test (JLPT), or an Examination for Japanese University Admission for International Students (EJU) score of at least 200 in the subject of Japanese or 400 and above for BJT. 3. Have passed our school’s Japanese exam, and has a clear goal in mind. ※Applicants must fulfill certain conditions in order to continue tuition fee exemption for next year. Students with excellent performance and behaviour will be recommended for application. For further information please refer to your school. AO Application period 1st August 2018 ～ Closes once maximum capacity is reached. For further information please refer to our brochure,or contact us. For further information please refer to our brochure, or contact us.